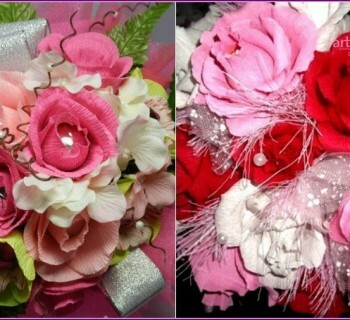 Bouquet - is an integral part of the image of the bride. Earlier, flowers donated by the groom in the wedding day, the girl zasushivat and stored together with the wedding accessories, wedding dress in the trunk. Recently, floral arrangement - it is not just decoration for the bride, but also the attribute used in the ritual that defines lucky, which is destined to marry next. The tradition of throwing the bouquet firmly entrenched and difficult to imagine the final wedding without performing this rite. 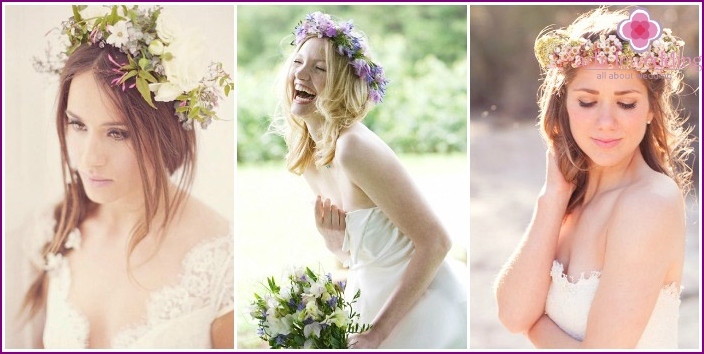 Flowers in the wedding composition mustbe living, perfectly combined with the bride's dress, her way. According to tradition, it is undesirable to use brighter, causing colors in the flower arrangement, the preference is to give light tones - white, cream, pale pink. Particular attention was paid to the flowers, of whichcomposed song, because if you know the "language of flowers" is not difficult to guess the feelings experienced groom a future life partner. For example, roses symbolize sincere, passionate love; Orchid - affection; Tulips - love, hope for a happy life together; lily - a symbol of gratitude, an expression of sincere feelings. 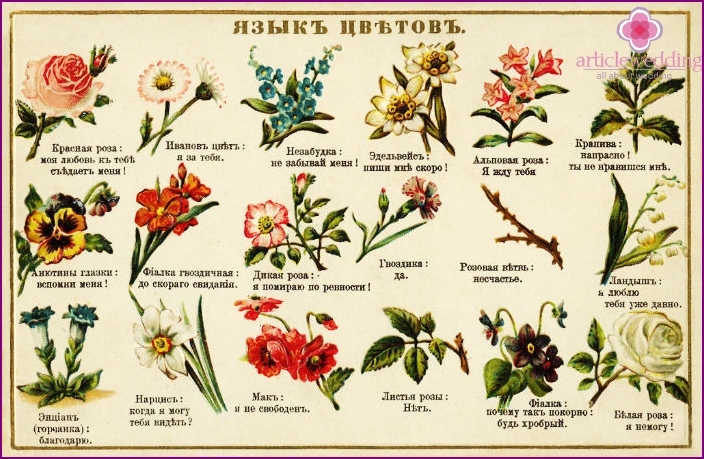 Once brides were bouquets yourselfor wreaths, collecting this certain wild flowers, grass - field of daisies, bluebells, cornflowers, according to the season - lilies of the valley, used to decorate the greens, such as ferns. It was believed that such a composition would protect the young from the evil eye during the wedding ceremony, as well as to protect them from damage marital happiness throughout life. During the day the wedding the bride is alwaysis to keep a bouquet with them, not letting it go. During the banquet he put in a vase on a table young, and in the evening the couple take it with you. According to another tradition, the bride, after the festivities, throws his bouquet to unmarried girlfriends. The one who catches it is believed to have the next go down the aisle. 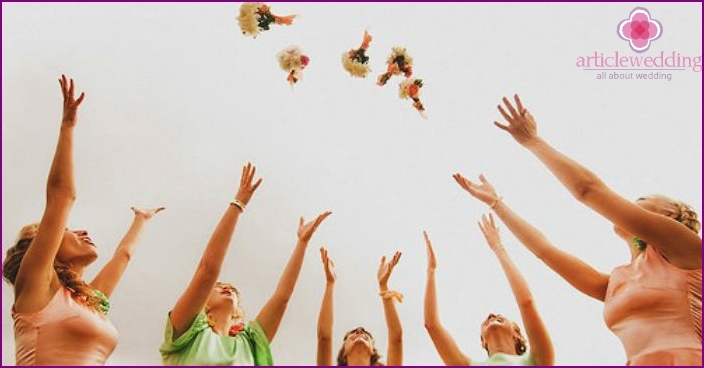 Many brides manage to combine the two traditions, using throwing bouquet understudy. This allows you to keep the bouquet, and thus does not offend the bridesmaids. Where went the tradition of the bride throwing the bouquet? In Russia, at the end of the evening, the bride tiedeyes, and her friends are ready to get married, grew around it. The girls were taken dance, and when stopped, the one that was closest to the bride, received the coveted attribute. In Europe, women firmly believed that a piece ofthe bride's wedding dress is sure to bring joy in family life, so do not hesitate to unmarried, tried to seize "tasty" piece of the dress, leaving the bride were only rags, and this upset her. Over time, with a view to please the girls and keep order intact, began to decorate the bride's dress with small flower compositions, which subsequently allowed to take unmarried. Later, it grew into a tradition to buy a bouquet for a wedding, and in the evening to throw his girlfriend.? Beautiful start taking this tradition in America. According to the story, one bride at the end of the evening, decided to please his girlfriend, gave her a bouquet with a wish to meet a loved one, and a happy family life. News of this spread throughout the country, and soon it became a world-wide tradition. Mutate, acquiring legends, traditiontransfer wedding bouquet attribute unmarried girlfriend came up to us. Many women with anxiety waiting for the end of the celebration, with the hope of looking at the bride and willing to do anything just to catch flowers. But do not be so serious about this ritual, because it's just entertainment, but fate is in your hands. To a wedding event was fun andinteresting, you need to come up and do something original. Few people know that the ritual throwing of the bouquet the bride an opportunity to diversify and play in different ways, making this process unique and exciting for both exhibitors and visitors. Popular options are: dance, auction, competition. But connecting the imagination, you can come up with its own exclusive way to share a small bit of happiness with her friends. If only one was in the wedding partygirlfriend who has not met his "prince" and found family happiness, it makes no sense to throw the bouquet. In this case, the bride should just pass the flower girl with the wishes of love, happiness, happiness. Optionally, the bride can add a little color postcard with warm words and heartfelt wishes. There is another version of the dice with ribbons. 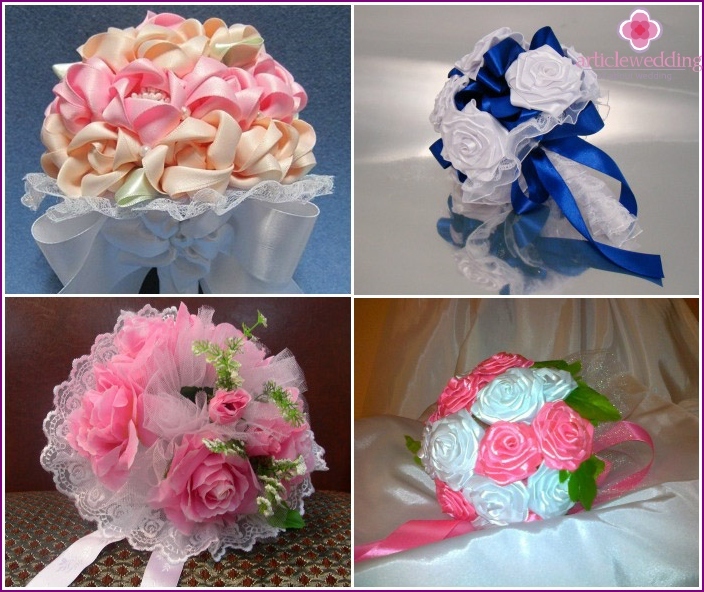 Each of those present unmarried girls tie a ribbon to a wedding bouquet. When all of the tapes are attached, the bride picks up the flowers, and one begins to cut the tape. The girl, whose last tape remains attached, and receives a bouquet. For such dice is desirable to select a single color ribbon. Ancient Russian way of "Runaround"
Do not forget about the old customs, they sometimescan add variety to our lives. A striking example - the tradition of transmission bouquet unmarried girl, using the old Russian way - to "dance." According to the ritual, the bride bridesmaids getting around, join hands, forming a circle and begin to reel. Bride spinning in the center of the circle, but in the opposite direction. When the music ends, dance and groom stopped and the girl who was the closest to the bride, it is the happy owner of the wedding flower arrangement. To please his friends, giving them a "piecehappiness "is not difficult. 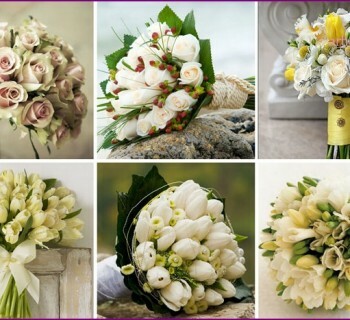 If the wedding will be two or three unmarried girls, the bride will be able to bring happiness to every pre-order a bouquet with a secret consisting of several individual flower arrangements, but it looks like a whole. Before you throw it, the bride quietly untie the ribbon that held the song and the girls will fly more than one bunch, and some small. Each friend will be able to catch a flower, and everyone will be happy. To save the intrigue is not anyone talking about such a surprise. It is unlikely that at least one modern weddingIt dispenses with the beautiful tradition of transmission bouquet to unmarried girlfriends. Which way it will be done - the traditional, using tape or use a round dance - it does not matter, as long as during the execution of the ceremony, the bride mentally desired future possessor of a happy marriage of colors, strong family, mutual love. A girl, in turn, need to understand that this is just a fun game, and if this time got a bunch of someone else, it does not mean anything. 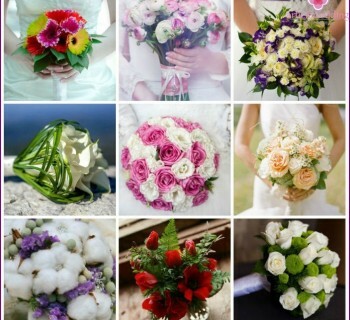 Wedding bouquet - how to choose and maintain?